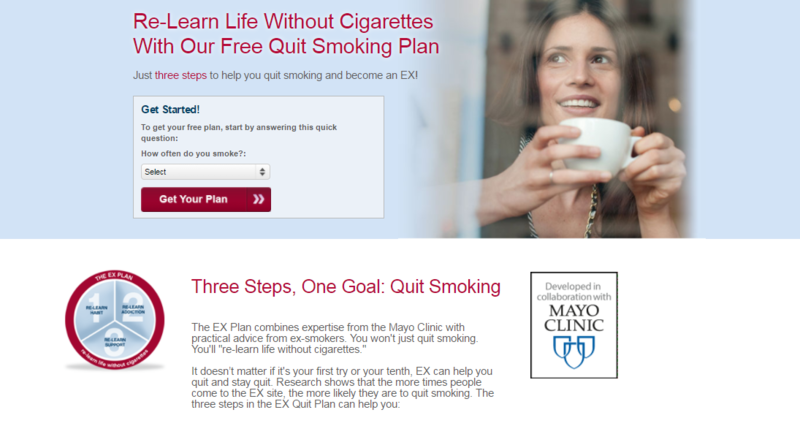 Become an Ex is a web-based program that aims to help users quit smoking and remain smoke-free. The program reports to utilize cognitive behavioral therapy principles, through the presentation of texts and videos that teach users how to identify their triggers (i.e., events or situations that make them want to smoke) and re-learn how to handle these triggers without cigarettes. The program emphasizes the importance of social support and directs users to “build” their support system. Users are asked to identify and document in a worksheet friends/family members who would be helpful throughout the process of quitting. Users can also gain support, encouragement, and motivation by connecting with other ex-smokers through blogs and forum posts on the community page. Additional features include psychoeducational information on how nicotine addiction and smoke affect the brain; tips on how to relieve stress and manage slip-ups; and blog posts written by researchers and clinicians at the Mayo Clinic. Become an Ex delivers professional, easy-to-understand content to help users quit smoking. Its main advantage, along with being free to use, lies in its ability to provide support and motivation to the user through an active online community, blog, and pushed e-mails. At the time of review, the online community seemed welcoming and supportive of its members, offering an available outlet to those who struggle with the quitting process. On the downside, the graphic design and usability aspects of Become an Ex are lacking. The program’s general appearance is outdated and unattractive, and the website’s design could be more structured in the way it leads the user through the process. The smoke tracker is somewhat inconvenient as part of a web-based program, as it is not as accessible and just-in-time as it would be in a mobile app. Furthermore, although the video segments are to the point and informative, the program lacks some more content presentation features that could engage the user (e.g., animation, narration, etc.). Become an Ex could be used as an adjunct to treatment for patients who want to quit smoking, either as part of an addiction-focused treatment or as an additional goal to achieve through treatment. The program, as described, can assist best in the support aspect of the process. The clinician should consider suggesting the online community feature and could incorporate in-session guidance on program use.